Louisville, KY-Visitors at the Kentucky Derby Museum get to attend a high-definition re-creation of the most recent edition of each year's classic at the Churchill Downs racetrack. 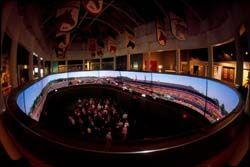 The realism of the show comes in part from the use of nine Panasonic HD PTDW 7000 DLP projectors mounted in a trough that runs around the base of the 80-foot-long (211-lineal-foot) projection field that's designed to approximate the oval course of the track itself. But the sense of authenticity also stems from an adroit use of video signal processing that takes into account the inherent warp in such a screen configuration, and from precise laser-based measurements between projectors and screens and between the screen segments themselves. The result is a high-def experience that's virtually as seamless as the race itself. At the Kentucky Derby Museum nine 10- x 22-foot perforated screen panels are arrayed in an oval encompassing visitors. The realism of the show comes in part from the use of nine Panasonic HD PTDW 7000 DLP projectors mounted in a trough that runs around the base of the 80-foot-long (211-lineal-foot) projection field along with E-V dual-mid driver-and-sub assemblies behind six of the nine screens pulling the viewers' focus along. One of the first projects Tim Creed ever worked on was the original display at the Derby Museum when he came into the business in 1985, when the display was a slide show shown by 96 static projectors. Over two decades later, Creed, now president of Communications Electronic Design (CED) in Louisville, was called in to update the exhibit, which had since transitioned to video, into an HD experience. Nine 10- x 22-foot perforated screen panels are arrayed in an oval attached to the drywall that makes up the museum's mezzanine. On the main floor, visitors look up to watch a series of video productions using still photographs and graphic images portraying the raising of thoroughbred race horses and telling the history of the 127-year-old Derby itself. These videos move from screen to screen in a non-sequential progression, with both the images and audio, from E-V dual-mid driver-and-sub assemblies behind six of the nine screens pulling the viewers' focus along. The challenge to getting the realism of the race across was in getting the projectors to work in perfect synchronization. "Synching high-definition MPEG-2 video can be a daunting task," Creed admitted. "Most of the encoding [of that format] is done for broadcast, so they use real-time encoders. In a playback situation like this, it's difficult to get various elements of a single production to start precisely at the same time on the same I-frame and to have the action move from screen to screen in perfect alignment." CED did its own encoding using Canopus ProCoder software. Subsequently, the video elements were loaded onto Alcorn McBride servers, one servicing each projector, all of which are controlled by an Alcorn McBride V-16 synch-start device. The HD format used is 720p, chosen because the format is best for fast action video content, Creed said. Next, CED technicians used line-generating laser measuring devices to determine placement of each screen along the oval track and to determine its distance and plane from the projector on the opposite side of the track hidden in a trough behind a glass cover. All measurements were made from dead center of the viewing pit to create a central reference point. Placement of the screens was blocked out using strings to outline the screen positions. This increased precision of the measurements would allow the width of the mullions-the gaps between each screen-to be minimal; in this case, they ended up about one inch each. The visual effect is that of a completely seamless video running throughout the oval. The warp of the screens to emulate the four turns of the racetrack was also critical to an accurate projection. Each projector port was fitted with a laser-cut mask to eliminate ambient glare from the projector lens that would have distorted the picture at the warp points. The video signal is also processed real-time as it's projected using a Silicon Optics Image Anyplace processor with an E-Warp option, which compensates for the warp angle.